Don’t know what to get for the quilter in your life? Portable Design Walls: 18″, 36″, 54″ and 72″ sq., come with carrying case. “Big Mat” Rotary Cutting Mat: 18″ x 24″ and 24″ x 36″. Easy on your rotary blades. 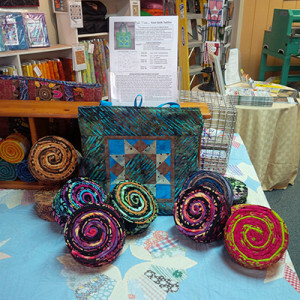 Pre-cuts: 5″ sq., 10″ sq., 2 1/2″ strips in Aboriginal and Batik fabrics. Olfa Endinceurance Blades: 45mm & 60mm. 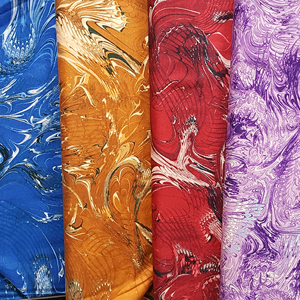 We regularly put together 6 assorted batik or aboriginal fabrics in coordinating colors for your buying pleasure. 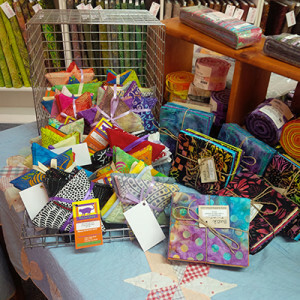 These make great gifts for quilters, who are sure to be delighted to add them to their existing stash! We carry a wide selection of colorful Bali Boxes from Batik Textiles that are a 3-in-1 gift. The boxes contain 5 half-yard cuts of coordinating fabrics that make into a lovely tote bag leaving you with a fabric covered jewelry or notions box. We carry hand stamped cards created by a local card designer. There are cards for all occasions and seasons. Ask for details about custom orders and larger quantities. Gift certificates make the perfect gift for anyone who sews or quilts! Gift certificates are available for any amount. Drop by the store to purchase. Gift certificates may also be ordered over the phone. We accept payment for gift certificates by credit card, and can mail the gift certificate to the recipient.